I understand the anger you must of had at that point. Ya, there were several issues in my forum relationship with Jerry that just had me wanting out! DeskDiver was the final stand for Jerry. The guy had a great talent for setting up forums and getting guys to join, but after 3 or 4 times people get pretty sick of their home burning down with no warning. I don't blame Don in the least for closing the doors once and for all. Thanks Andrew, truer words have never been spoken...err, typed. Welcome to the forum. The Debaufre' is no longer being made and their site shut down. 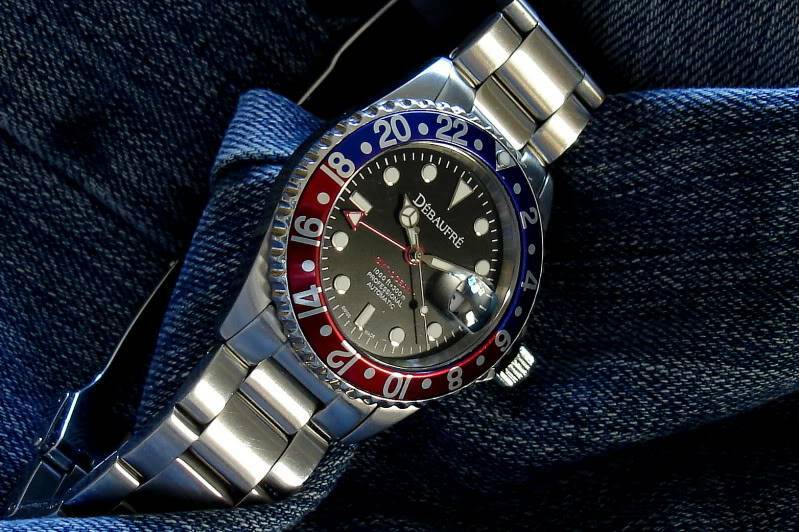 Guess is if you still wanted that model it would have to be a Grovana or Steinhart. Actually, both Andy and I own that watch. I tried his on when I was in NY visiting him. FreeDive wrote: DeskDiver was the final stand for Jerry. The guy had a great talent for setting up forums and getting guys to join, but after 3 or 4 times people get pretty sick of their home burning down with no warning. I don't blame Don in the least for closing the doors once and for all. I was angry when Jerry shut down a previous forum without warning. I'm just as angry that Don shut down DeskDiver without warning. Shutting down without warning punishes the members who actually contributed. Well Mike, you can be angry, however, you didn't post a single thing for a week prior to me shutting it down. I was getting tired of 4 members posting in the wrist check threads. I wasn't about to wait until it was just Brice and I posting! Sorry, Don. I was out of town, out of touch for a week. falcon4311 wrote: Well Mike, you can be angry, however, you didn't post a single thing for a week prior to me shutting it down. I was getting tired of 4 members posting in the wrist check threads. I wasn't about to wait until it was just Brice and I posting! SynMike wrote: Sorry, Don. I was out of town, out of touch for a week. Ocean wrote: Welcome to the forum. The Debaufre' is no longer being made and their site shut down. Guess is if you still wanted that model it would have to be a Grovana or Steinhart. Thanks! As Don said, I do own this watch. It jumped off the page at me when I first saw it in a watch mag ad about 5 years ago, being one of the only affordable watches in the entire publication. Debaufre has a weird story, but as you pointed out they're gone now altogether. My mistake do like the pic and yes they do have a weird story. Bump for the email that went out today. The demise of DD took me quite by surprise too. Sorry to see it go but I have to admit I was posting less and less although I did check in every day. Hope to see a lot of the regulars from there sign on here. MAXg wrote: The demise of DD took me quite by surprise too. Sorry to see it go but I have to admit I was posting less and less although I did check in every day. Hope to see a lot of the regulars from there sign on here. I know Marc, it just got to the point where it didn't make any sense to keep things going. Having 4 people posting was a complete waste of time. THG was doing very well back when Jerry shut it down but for some reason DD just could not get an wind in the sails. I wish it didn't happen the way it did but I can't look back with regrets. Hello, another former DD members signing on. I wasn't surprised that Don decided to shut the forum down, the writing had been on the wall for some time. I was thinking of taking a break from the forums anyway as I'm not looking to add any more to my 29 watch collection and I felt like I didn't have anything new to add. Hopefully I will be able to contribute to the discussions here. It's nice to see you here Russ. There are many people from Desk Diver that I'd like to stay in touch with. Hello from a former forum fella. Hello to all the DD guys. Welcome to WF. I accepted a promotion in December and haven't the chance to hang around or post like I used too, but appreciated this forum. To echo what Mortus said, lots of WIS here. Great place to learn. So, again, welcome. bodypeersur wrote: Hello from a former forum fella. Hey Duff, good to see you here!